Astronomers at the European Southern Observatory's (ESO) Very Large Telescope (VLT) have been celebrating their first pictures with the delightfully titled MAD: Multi-Conjugate Adaptive Optics Demonstrator. This little gadget (see picture) allows the scientists to correct for atmospheric turbulence in their observations, meaning the images they receive are of near-space quality. It also allows for image correction over the full 2x2 arcminute field of view for the first time. Atmospheric turbulence causes stars to twinkle, but also blurs the fine detail of images taken from ground-based telescopes. Adaptive optics use a computer-controlled deformable mirror to overcome the distortion brought about by the variations in the atmosphere. A dedicated camera known as a wavefront sensor passes data to the computer which makes real-time optical corrections based on the incoming data. The technique was first used back in 1989 at the La Silla Observatory. But until now, AO systems have only been able to correct for the distortion over a small portion of the sky, up to 15 arcseconds. The test "pictures" were taken on 25 March and were centred on three 11 magnitude stars within a 1.5 arcminute diameter circle of sky in Omega Centauri. The 'scope will continue to observe this region for a number of nights to see how well the equipment performs in a variety of viewing conditions. 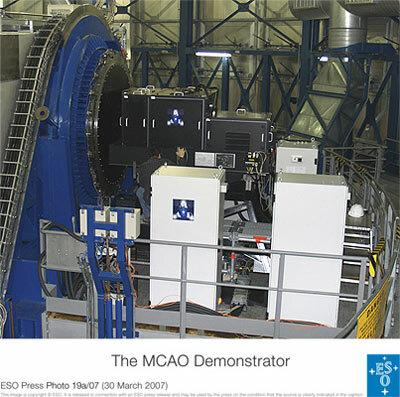 "The aim of MAD is to prove the feasibility and performances of new adaptive optics techniques," says Norbert Hubin, head of the AO group at ESO. The findings from these early tests at the third unit of the VLT will prove critical to the development of future instruments, he explained.